In a nutshell: this page explains about the different groups of people who teach undergraduate courses at York University, and that I'm a multi-award winning university teacher, with a penchant for trying out lots of different ways of teaching and learning in my courses. I update my courses all the time, which means that if there's old stuff in my course, it's there for a reason, and not because I'm lazy. 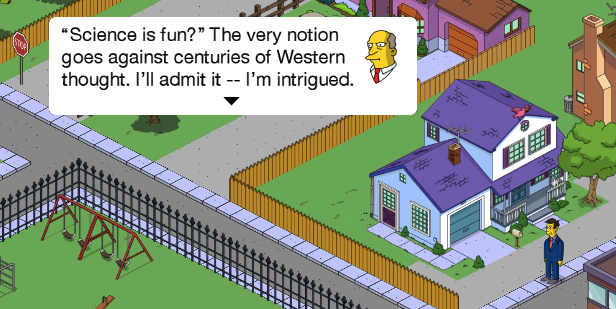 PS The screen grab above is from Electronic Arts The Simpson's Tapped Out Game. Biology students (graduate and undergraduate) will find useful resource links and also blogs about teaching here. Why students should ask "Who is teaching me this course, and why?" Contract faculty who aren't in CUPE3903, who are hired to teach graduate courses, but who do not accrue CUPE3903 seniority with respect to undergraduate teaching. (NB this is my understanding of number 4 and I could be mistaken about the latter). Not all of these Course Directors may have a doctorate, though, increasingly, most do. Course Directors in category 4 are not part of a union and don't qualify for benefits of various kinds. There is much debate and controversy about how higher education teaching over the last few decades, has increasingly been done by Course Directors in categories 2 to 4. There are definite consequences of this for course directors in categories 3 to 4: from income to preparation time. Mellonie Fullick, a PhD student in York's Faculty of Education, has one of the best blogs about higher education in Canada and beyond: Speculative Diction at University Affairs. The issue of increasing numbers of adjunct and part-time faculty who lack much of any job security has been widely written about from all kinds of perspectives, including what it means for the student. York University students enrolled in courses should, in my opinion, aim to be informed about who is teaching them, and why this may be the case. I'm a tenured professor in Course Director category 1. University profs like me, who have much more job security than adjunct and contract faculty, have 3 main parts to our jobs: teaching, research, and administration. Administration is the part of our job where we put on our bureaucratic hats to organize stuff that goes beyond our immediate teaching and research. We do this in our department, faculty, university and beyond. These duties often include sitting on COMMITTEES and going to lots of MEETINGS that I sometimes find to be boring, rather unfocussed, not very-well chaired and therefore, rather a waste of time. However, I have also been present at many well-run, productive meetings during my time in student clubs from public school to university, and while sitting on various non-profit boards . Additionally, since I have read Robert's Rules of Order, I have learned how to run a meeting, and it is my goal, that when I am appointed to sit on these administrative committees, to ensure that their work has purpose, is done efficiently and effectively, and has measurable, positive outcomes for the task at hand, and the university. Teaching itself, also involves a lot of paperwork and administration. When you get your grades, that's the result of in-course administration, form-filling and bureaucracy. Course preparation involves lots of administration: e.g. ordering text books, setting up Moodle (or, years ago, course websites), organizing library training for students, and overhauling lab. manuals, to name a few of the jobs. I consider this in-course administration to be different from administrative work like contributing to a task force on university teaching in general, which has a broader goal. I teach across diverse subject areas and often give guest lectures in other courses, both at York and other universities. Since my home unit is the Biology Department, my main teaching is undergraduate courses. I've taught first year Biology (BIOL 1010), Plant Biology (BIOL 2010), Ecology (BIOL 2050), Plant Ecology (BIOL 3290 - previously BIOL 4090) and Applied Plant (BIOL 4095). I also supervise Honours Thesis students in BIOL 4000 and many Research Practicum students work in my lab, and I teach field courses. Teaching is hard work. It's especially hard work to do it well. But, I find teaching undergraduate students rewarding. In fact, I like teaching everyone, and getting people excited about not only ecology, but biology, science, social sciences, geography, history -- you name it. I'm just as interested in learning new stuff myself, and I recently signed up for a MOOC (massive online open course). In my experience, good research and teaching go hand-in-hand. The best researchers are interested in learning about pretty much everything, because they are curiosity-driven. In my courses, I not only teach students about "facts", but also about how to ask and answer questions, about general knowledge, and about so-called soft-skills. 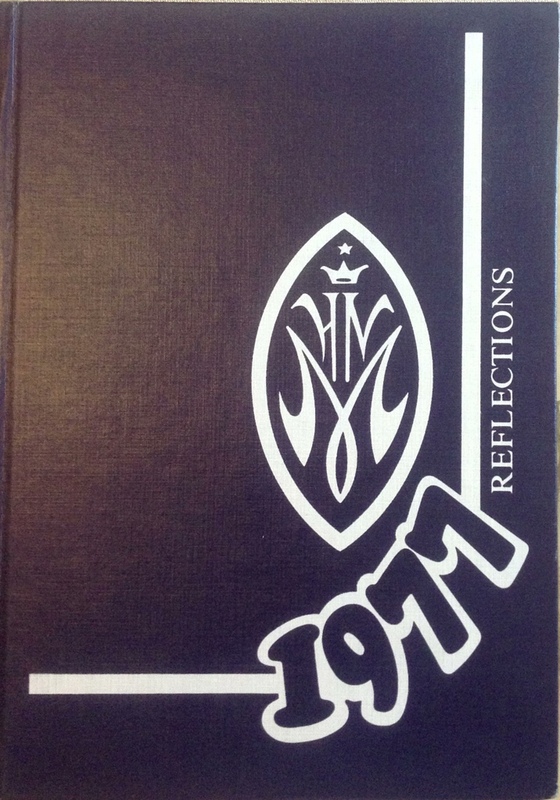 Faculty are encouraged to reflect on this and write up ideas in our teaching statements and philosophies. In addition to writing teaching statements, I have also published articles on curriculum development. In 2013, I decided to incorporate social media and blogging into my courses. I learned about Twitter - @dawnbazely. I have since, given conference presentations about the use of social media in teaching. 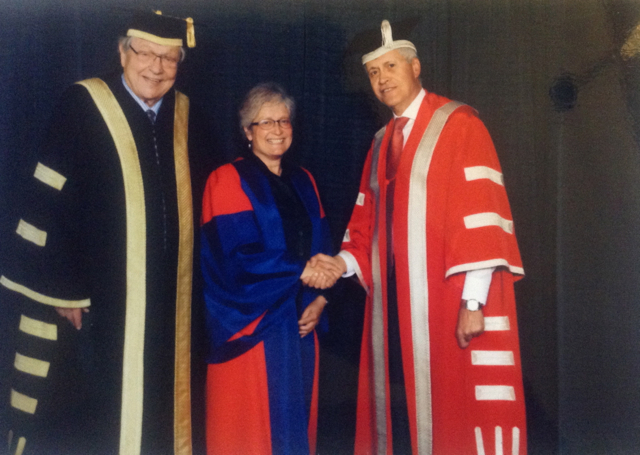 This is me receiving the York University Senate President's Teaching Award in the Senior Category, for over 10 years of teaching at June 2013 convocation. York University Chancellor, Roy McMurtry, is at left and President Shoukri is in the fabulous red gown. I'm wearing a University of Oxford D.Phi. gown. This particular teaching award category is the one for middle-aged and old profs. This was the second time that I was nominated for it. I won the Faculty of Science & Engineering Teaching Award in 2003, the second time that I was nominated for it: my hair was a different colour. PS Chancellor McMurtry, who retired in 2013, is the former Attorney General for the government of Ontario (that's the top lawyer in the province), former Canadian High Commissioner to the UK, and also former Chief Justice of Ontario. 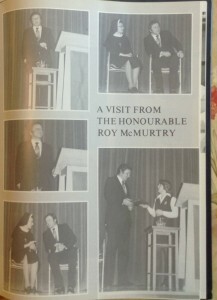 It was a real honour to be presented the award by Chancellor McMurtry, because the last time I met him in person was when he came to speak at my all-girls catholic convent high school (HNM - Holy Name of Mary), just west of Toronto in 1976. 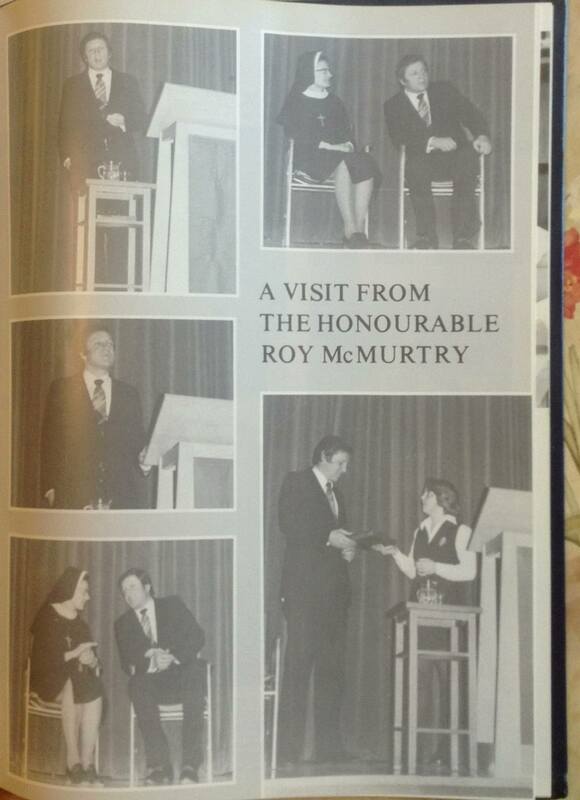 At that time, he was in the provincial cabinet, as Attorney General. He gave an inspiring speech about the need to do one's civic duty!